Today I am sharing a smile and a card. 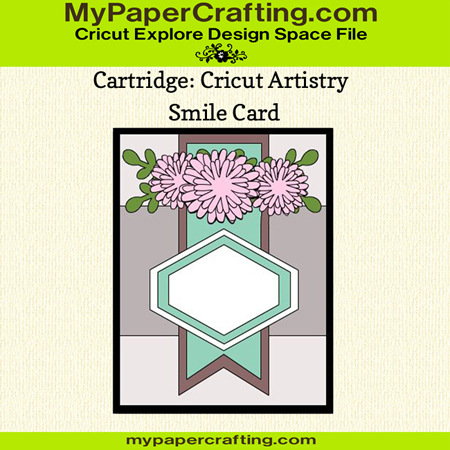 I created this fun card with the new Cricut Artistry Cartridge and the Cricut Design Space software. I used some pretty Blossom paper and embellishments from Close To My Heart. Here’s a look at my completed card. The card base is made from white cardstock and is a standard A4 size (4.25 x 5.5) I started by designing the card in the Cricut Design Space software. Once I had laid it all out, I decided on my papers and went to cutting. Here’s a closer look at the pretty flowers. I used some more of the pretty blossom paper to cut the flowers from. I curled the petals and added some foam tape to give them a little lift. I added some fun Aqua dots to the centers. Here’s a closer look at the Smile sentiment. I stamped it with my Lagoon ink pad. I added a couple more of the fun aqua dots and added some foam tape under the bottom white layer. Don’t forget about my great Special if you purchase the Artistry cartridge through my link. 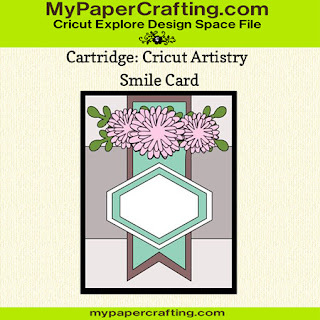 Here's a look at the Cricut Design Space File I created. All the cuts are from the Cricut Artistry cartridge. This was a FREE file for my Newsletter subscribers this week. So be sure to sign up for my newsletters so you don't miss out!! !